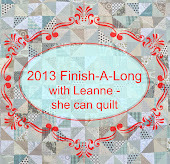 We had 288 linked finishes in Q2, and 357 linked finishes in Q1 - I think that the Finish - A - Long is working! We are getting our unfinished projects done and out of the sewing room. It is time to link your Q3 list. The rules are here, and if you have any questions, let me know. The main thing is that the project needs to be a UFO - that is actually started - and that your need to plan to completely finish it, not just get it to the next stage. There is no penalty for not finishing, so go large, there are great prizes to be won - thank you to all our excellent sponsors. As your FAL cheerleader, I get to make my list first. So no laughing, at either its length or the repeats please. 1. Octagonal Orb quilt for Siblings Together: My plane leaves in 8 days, the pressure is on. I got that much quilted yesterday before bed. There is a picture of it on the floor during basting. I love how smooth the quilts look at this moment before you put the pins in. 2. Set of four placemats for my new antique table: I have one done, one is waiting for its binding, one is just a top and one is cut up strips. But I need these as we cannot really eat on the table without them. 3. Pickle Dish Quilt - The wedding was beautiful and this is now overdue for the eldest. I have 131 dishes out of 200 done. 4. Grannie square quilt - These blocks are so lovely, they were made by my friends in the Modern Stitching Bee. I need to get this quilt done. 5. Emerald Irish Chain: This one has just a small corner to be quilted, there is no reason for it to be not done. 6. Low Volume Quilt with circles on it. I really want this one for the August, so I hope to get to it when I get home from London. Hmmm, maybe I can bring it as a handwork project at the retreat. That is mommy robin yesterday with three of the four babies stretching up. It was a weird day, thunder and lighting, then a bit of sun, on and off all afternoon so she was vigilant and did not want me to take close up pictures of the nest, hovered about and such. I will see what I can get today of the inside of the nest. So make your list, check it twice and link it up. Remember, you can link flickr photos with your plan in the description if you don't have a blog or have no time to blog. The link will be open until July 15 at midnight MST time. If you have any trouble linking, let me know and I will help you. Thanks Leanne for organizing a 3rd quarter of the FAL. It really works for me! You have some lovely projects on the go! Mama Robin is working overtime! Wow, that's alot of finishes over the first two quarters! I know I'm glad for all the ones I've got done so thanks for hosting this. The plane ride in 8 days--is that the London trip noted on the side bar? If so, how exciting and hope you have a great time! You have a lot to do. Hope you get some time off this summer to do it. Maybe at the cottage. You are the list master! ;-) So looking forward to these finishes - especially the ORB and those delightful placemats! Thanks for all you're doing for us FAL-ers! Im joining this for the first time, but Im really impressed how many quilts you are sure to complete in only 3 month, wish I would be this fast too. I hope you get lots and lots of sewing time this summer! I love that table mat - the quilting is gorgeous! Good luck with your list, it's full of beauties! Thanks for hosting this supportive and inspirational event, Leanne! I've decided to join in for the first time this quarter, it was perfect timing! You've got some beautiful projects on the go and I look forward to seeing your progress in Q3! Have a fantastic time in London! You have an amazing list! Those are all big, amazing projects. Have a fabulous trip to London, can't wait to see the pictures and hear all about it. I just love those octagonal orbs! No one is laughing at the repeats, cause we've all got em! Ha! I wanted you to add the babies to your FAL list. Launch four more little birds...check. You have a wonderful list with beautiful projects. I so look forward to watching them progress! The variegated thread looks fantastic on your placemats, just the right size to show off those colours. I'm cheering for you! Great list and love the placemat! You can do it Leanne! So love your low volume quilt. Also, the geek in me just squeed because I got the 42 slot! love that varigated thread for your placemats - such a gorgeous colour - can you tell me what brand it is ? I'm looking for some quilting thread to get those tops done !! Ohhhh, your Octagonal Orb quilt is to die for!! I love it! Thanks so much for hosting this...it has been so awesome! A push in the right direction! Not sure I would have finished my UFO's without it!! Love the fact that repeats don't doom us to the proverbial quilt corner. I have a few repeats on mine as I've been slowed down on my starts, and only have a few lingering "begun" projects. I hadn't remembered seeing the placemats for the antique table--beautiful. And good luck with the quilting on the Orb project. And have fun in London! I can't wait to see all of your projects finished, they are just all so pretty and each so unique! I am so happy I could help with that siblings together quilt because it certainly turned out FANTASTIC! Thanks for hosting this FAL! I appreciate any help in keeping me focused on finishing up those projects. First time linking up so looking forward to seeing how well I do! So many talented people and awesome projects to see!! Thanks Leanne! It's nice to know that you struggle with "repeats" as well :) Thanks for hosting this! Thanks for hosting! Looking forward to getting through at least SOME of my list! Joining for the first time. Hoping to get a lot of my UFO's complete. Can't wait to see what you do with your projects, especially your Octagonal Orb and those placemats!